Other Names: Australian River tortoises: Emydura spp. There are at least 5 species of this genus (Cogger 2000). They look and behave similar to their close relatives the 'Australian snapping' or 'Saw-shelled turtles' in the genus Elseya. Also like the snapper/saw-shells, they are found in creeks and lagoons in Australia and New Guinea. 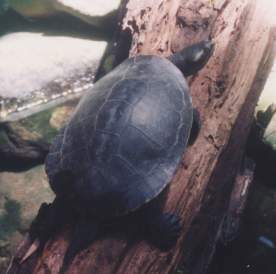 Here they can often be seen basking on logs and the sides of waterways; if disturbed, they drop into the nearby water with a splash and disappear. However unlike the Elseya, they often have a small, pale stripe on the face behind the eye (above). They are also generally smaller than the Elseya. They are often called the 'short-necked turtles' to distinguish them from the 'long-neck turtles' or 'snake-necked turtles' of the same family that are also common in Australian waterways. The most common turtle found in small creeks along the Daintree coast. A medium sized turtle with a shell up to about 30cm, a short neck, and usually has a yellow streak on the face behind the eye. It is found in streams and associated pools of water along the east-coast from central Queensland to Northern Queensland. If you can sneak up on them, they can be seen basking on rock or logs in the smaller streams where they are quite common. They tend to be rarer in the larger more open rivers where there are crocodiles.